Located on broad acreage in Upper Beaconsfield, Victoria, Ashford House exudes contemporary design, inspired by the traditional farm-style Colorbond shed. Utilising minimalistic architecture, the home emanates luxury and quality craftsmanship. The floor plan consists of four bedrooms, three bathrooms, a gym, butler’s pantry and a spacious kitchen, dining and living room – forming part of the entertaining and alfresco area. 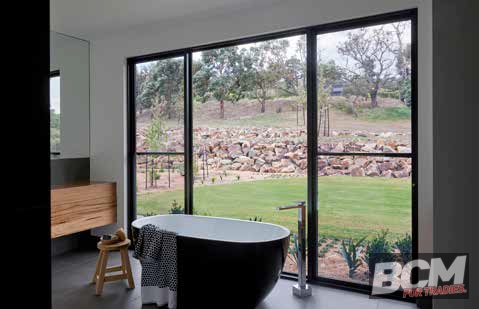 Built by owners Steve and Donna Bright from construction company Excelcon, alongside Graham Jones Design, the design brief was to frame the home and provide spectacular open rural views. “We wanted to incorporate floor-to-ceiling windows that could run seamlessly along the length of the house,” said Mr Bright. Excelcon worked closely with Stegbar to customise windows to the specifications required. The Stegbar Alumiere range was a perfect fit, offering the look of bespoke joinery; with black bold framing that complements prestigious residential homes, where the emphasis is on ample windows and open plan living. To seamlessly bring the outdoors in, Stegbar Alumiere Stacking Doors were specified, allowing Steve and Donna to take advantage of the alfresco space all year round. “In winter, we can keep the doors closed and still feel connected to the outside due to the large panes of glass and unobstructed views. During the warmer months, we can completely open them up and create a cohesive transition from inside out,” said Mr Bright. Working collaboratively with Stegbar, a method was developed specifically for the Ashford House project, in which the Alumiere windows and doors could provide lateral and cross-sectional strength to the home’s structure – appearing as if they’re holding up the home’s entire structure. In addition to structural integrity, the Alumiere window and door suite provides superior acoustic performance and is manufactured to resist the elements and high winds, creating a leak and rattle-free solution. “The design of Ashford House was always going to provide a challenge to window manufacturers. With a longstanding working relationship and a cohesive approach to construction, Stegbar’s Alumiere range has enabled us to achieve a final overall look that is true to our design brief, and creates an extraordinary home,” concluded Mr Bright.